weekend and maybe had some time to do some crafting. 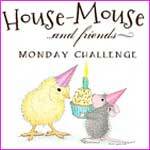 House Mouse and Friends are ready with a new challenge for you. whatever you feel like making. We can't wait to see your creations. badly on cross country skiing a while ago. She really needs an encouragement. I have used a new stamp of mine, 'Color Me Better' it's called. The sentiment is from LOTV and the papers are some old ones from Maja Design. soon see another card featuring 'Color Me Better'. There are more bad legs in my surroundings right now! I guess you will recognize the elements from the front. you to make beautiful cards, scrapbooks and other craft projects. Nice challenge, Dot, thank you. I really like this card with this precious image and your color scheme. Just great. Have a sunny day. it's a very lovely card Dorte. This is a gorgeous card Dorte, I love your sweet image and lovely sunny colours - perfect, your card would cheer anyone up. Stunning card for your friend Dorte....love your coloring and the backside is a beauty too! 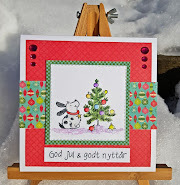 Such an adorable card Dorte, I love those gorgeous papers and your image is just so sweet!!! Wonderful get well card Dorte. Such a cute HM image, beautifully coloured. Hi Dot, love this sunny yellow and plaid card. That image is so sweet, your friend will surely feel better after she receives this and knows you are thinking of her. Your card is so adorable!!! Just love the colors! Thanks so much for joining us at www.7kidscollegefund.com! So cute, Dorte! I love this image, and you did such a wonderful job with it! This is a sweet image... polka dots on a cast! Fun! Thank you for participating in the Sweet Stampin' Humor Challenge this week! What a nice card. I love the stamp. Such a sweet card! Your friend will be very pleased to receive it. I love the colors you've used. It's a Colour Challenge, DT card for HM&FMC. Show Some LOVE, mid-way reminder for HM&FMC.